This is text in English. 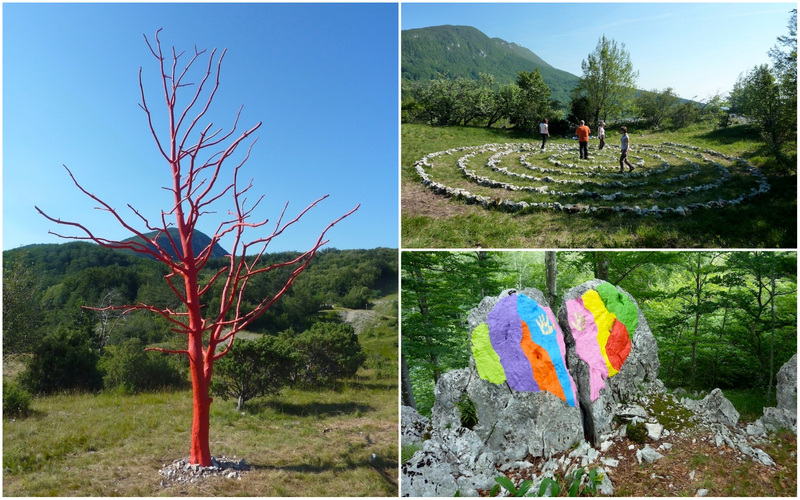 Stražica – Sapaćica Land Art Trail is on Mt. Učka (in Učka Nature Park), on the border of Istria and Kvarner in Croatia. It has been opened in July 2016, two years after the initial idea by artist Boris Pecigoš, and completed by the end of that year. In this article you can find all the key information you need for your enjoyable walk through the Land art trail, and for understanding the artworks you will encounter. This 6.5 km long circular trail is a combination of artistic interventions in the form of land art and rock art, and the natural features of Ćićarija, i.e. its southern areas around the Stražica cliffs and Sapaćica pastures. The artworks are in places in which you would least expect them. The guiding idea behind the trail, which is the conceptual project of artist Boris Pecigoš, is to raise awareness of the importance of the connection between man and nature. Man is, regardless of the alienation and bustle of today’s way of life, an inseparable part of nature. Although by his very existence he has an influence on nature and changes it, he can learn to follow the rhythms of nature and respect other creatures that share this planet with him. As you walk, inhale the fragrance of the forest, listen to its sounds, feel the moist soil under your fingers, caress the soft moss, hug a tree, let the sun caress your skin, soak in the lush greenery and feel the powerful energy of nature around you. You don’t need to search for feelings of oneness with nature because they will come spontaneously. It is only important that you are present. Don’t forget to look for the land art, that will prompt you to contemplate and meditate. Stand in silence, feel nature and connect with it as you observe the artistic work. Touch the handprints that are situated on some pieces of art, and make contact with nature. Feel the effect of nature on your physical, emotional and spiritual well-being. Think about your relationship with nature and become aware of your connection with all things created. Breathe as one with nature. Land art is today a very diverse art form. The works are created in the very nature using natural materials found in situ (stone, gravel, soil, tree trunks, branches, leaves, snow, water… ). Sometimes artificial materials are introduced. Painting the rocks with eco-friendly paints, as is the case in some of the works on this trail, is called the rock art. The land art works are situated in the open air, located far from civilisation, left to change and disintegrate under the influence of natural forces. Land Art as an art movement emerged in the 1960s in the US. Still, the cave drawings, megaliths, geoglyphs and petroglyphs of the ancient tribes, show that from the beginning of humankind this sort of expression has been inherent to man. This is an easy walking trail in the mountain, suitable for families, children, elderly people. Nevertheless, have firm shoes (hiking or mountaineering shoes), a hat for sun protection in the summer, and for protection against cold and wind during winter. Walking sticks are not necessary but will make your walking easier. Take enough water, especially in the summer. Take some food too, because you may want to stay in nature a little longer than 2 – 3 hours needed for this trail. Have The Trail Map with yourself, or The Guidebook even better. You can download them to your mobile device or print them out. Land art trail has two entrances that are on the road which connects Kvarner and Istria across Mt. Učka. The main entrance is located on Poklon, near the Info-center of the Učka Nature Park, mountain lodge (Planinarski dom Poklon) and Pansion Učka restaurant. The second entrance is near Dopolavoro restaurant, opposite the intersection where minor road turns for the Vojak, the highest peak of Učka. There are information board and signpost stone on both entrances. You’ll need a car, your own, rental or taxi, because there is no other means of transportation to the entrance of the trail. Only on Sundays, Poklon pass can be reached from Opatija (Slatina bus stop) by the local Autotrolej bus line no. 34. Opatija departure at 09:40 and 14:10, Poklon return at 10:30 and 15:45. The journey takes about one hour. If coming from the direction of Rijeka take the E61 (A7) ring road and highway E751 (B8) in the direction of Pula. Take the exit for Veprinac. At the first intersection, turn left for Veprinac. At the next intersection in Veprinac also turn left (there is a sign for Učka). 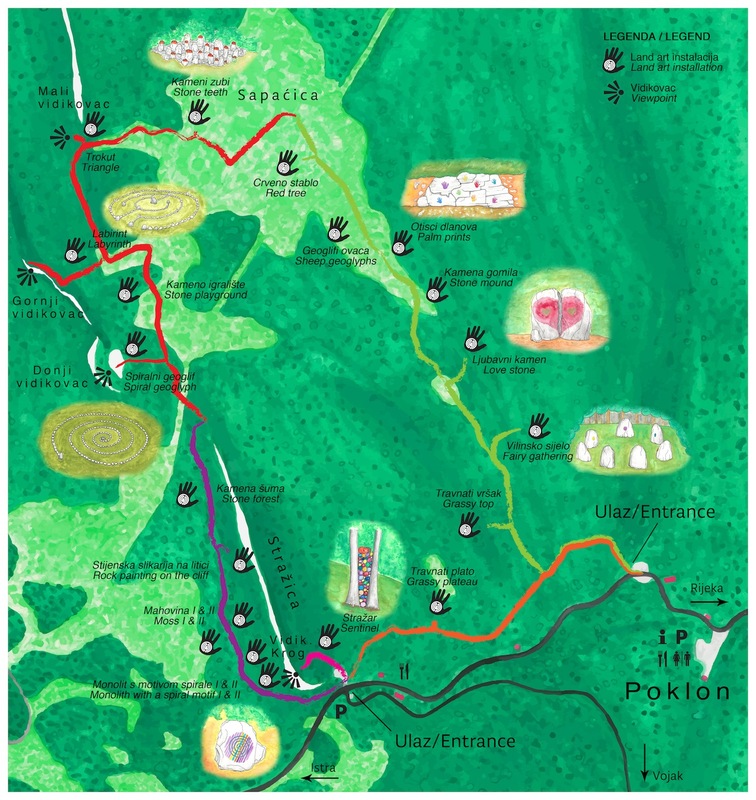 Drive for about 7.2 km to the Poklon and the first Land art trail entrance. The second entrance is located 800 m further down the road. From the direction of Istria via highway E751 (B8) exit in Vranje, just before the tunnel Učka, at the exit for Cres, Labin and Vela Učka. After the toll, turn right as the sign for Vela Učka shows. To the second Land art trail entrance drive for about 4.9 km. The first, main entrance is located 800 m further down the road.. Although the Land art trail has two entrances, start from the main entrance at Poklon (Entrance 1), and then go around the trail in the anticlockwise direction. In that way, you will go through art works in the order in which they are listed. Follow the path and it will naturally guide you from one stop to the next. Everything is well marked so you can not get lost, and you will not miss a single point. Just watch for the markings and signposts. The trail is divided into 5 sections, each marked with its own color. Start following the green markings placed on the trees and rocks. Along the green section of the trail there are seven land art installations (here marked with numbers 1 – 7). Then follow the red markings and you will find five more land art installations (here marked with numbers 8 – 12), and three viewpoints. On the violet section of the trail there are six land art installations, mostly in the form of rock art (here marked with numbers 13 – 18). Then you come to the Entrance 2, where short pink section of the trail leads you to the Krog viewpoint on the Stražica cliff (1001 m), and along that trail there is only one land art installation (marked with number 19). When you get back to the Entrance 2, follow orange markings through the forest and they will return you to the Entrance 1 and Poklon, where you started your journey. Along the orange trail there is also only one land art work (here marked with number 20). As you walk through the woods and pastures, you will encounter the works of land art and rock art. You will surely wonder what they mean. So, description and meaning of all 20 artworks follow. This beautiful place in the shade of trees offers you the opportunity of the first deeper contact with nature. A stone circle with footprints in the limestone slab invites you to take off your shoes and stand inside it, be calm and quiet, listen to the nature around you and feel yourself as part of nature. Your view will then spontaneously be directed to hanging mandala, land art construction stretched between two trees on a small ridge that connects the two neighboring dolines. Mandala serves to focus your attention so you can easily enter a meditative state of deep relaxation. Near the stone circle, surrounded by thick green grass, there is a nice beech tree that you can embrace and thus literally merge with the forest. On a small hill seven stones, that nature has placed in a circle, stick out of the grass. According to the sayings of the old, in places like this the forest fairies gather. Local legends speak of the “vile Učkarice” (Učka fairies). Enter the circle and choose one of the seven painted stone symbols which attracts you the most, sit next to that stone on the soft grass and enjoy the shade of this magical place. The symbols represent the seven letters of the word “nature” (“priroda” in Croatian) written in cursive Glagolitic alphabet. Also hug a beech tree that grows from a large stone and as a guard leans over the stone circle. Listen to and watch in silence… maybe you’ll get lucky to see the forest fairies! The nearby meadow with a little pond in the shape of a heart is a cute place for romantic picnics and can become a meeting place, not only for wild animals such as roe deer, deer, wild boars, foxes, wolves, bears and others that come for the watering and grazing, but also for humans as refreshing point. Puddles in the past played an important role as a watering hole for cattle. Today, they are left to decay because fewer people are engaged in animal husbandry. Puddles and their maintenance are important for biodiversity conservation because it entails a rich world of water and marsh plants and aquatic invertebrates. Hemispherical stone mound with painted capstone and two branches directs hikers on the right path. On the grassy slope opposite the stone mound some nice larch trees grow. This is the only place on Land art trail with the larches. Larch is one of the few conifers that in winter releases its needles. In early spring the female cone-like flowers attract with its red color. This land art (actually rock art) carries a message of the positive impact of man on nature. The pasture Sapaćica as well as other pastures on Učka did not occur naturally but from the millennia of man’s activities, deforestation and sheep grazing. Over time, the new ecosystem stabilized with meadow plants and animals. Because of the distinctive and rich flora and fauna, grasslands are a significant reservoir of biodiversity of wildlife. Today, this ecosystem is threatened due to the emigration of people from Učka and neglecting of traditional activities. Meadows are unfortunately less used for pasture and as hayfield so they gradually overgrow with forests, and many meadow species are threatened with disappearance. The palm prints on the rock want to show the actions of human hands that have left a positive impact on the colorfulness (biodiversity) of the natural world. In a symbolic way the sheep geoglyphs return the flocks to the pastures and represent the indigenous Istrian species – Pramenka, on pastures which were once used for grazing in the past. The area of origin and cultivation of Istrian sheep Pramenka is our largest peninsula of Istria, according to which this breed got its name. It is a the most lactic Croatian original breed of sheep. Sheep are usually colorful or black and white, rarely completely black, while there are the least completely white individuals. As milk contains an average of 7% fat, it is mostly manufactured in the traditional semi-hard, full-fat cheese and the curd. The message of this land art is the negative impact of man on nature. The gas pipeline, powerline, transmitters, radar, road, the Učka tunnel – all of these are man’s products which unnaturally stick out amidst the mountain beauty. And so this red tree, located on high ground in the middle of Sapaćica pasture, between the route of the gas pipeline and power line, unnaturally dominates the landscape, transmitting a message about man’s destruction of nature. Still, it draws attention, attracts and invites you to sit beside it and enjoy the view of Učka and the hills of Ćićarija. The bare stone surface stands out like a stain in relation to the surrounding grass, whilst numerous stone teeth protrude into the air. The golden painted teeth send a message that longevous nature can very well “show its teeth” if man goes too far with its destruction. Stone triangle with its peaks direct hikers to pasture Sapaćica and Poklon (Entrance 1), to Stražica (Entrance 2) and to rest stop on Little viewpoint (Mali vidikovac). If you look carefully at the triangle, as well as at the nearby scattered stones you would find spiral fossils of planktonic foraminifera. The geoglyph in the shape of a labyrinth directs you to stay on the right path on the sharp turn of the trail. It also points to the trail which leads to the Gornji vidikovac (Upper viewpoint) with its beautiful view of Istria, the geomorphological natural monument of the Vela Draga canyon and the main Učka massif. Geoglyphs are the form of land art, motives “drawn” on the ground, usually by stones or similar permanent landscape elements, such as gravel, soil, planted plants, hedges or trees. The term petroform is also used for the forms made of superimposed pieces of freestanding stones. Labyrinths are complex forms of path leading to the center and back, and mazes are wide networks that require resourcefulness and orientation to find out the exit. The famous ancient labyrinths like Minoan on Crete, Roman mazes, labyrinths in medieval Christian cathedrals, and even todays labyrinths in certain circles, are given spiritual significance – circling the winding paths of the labyrinth to its center represents the quest for answers and the journey to the center of the soul, coming into the center of labyrinth symbolizes contact with the divine and the acquisition of knowledge or insight, and then follows the return and realization of acquired insights. Labyrinth can be shown on a drawing or picture, but if it is made in the form of geoglyph (petroform) falls under land art. Given the abundant source of broken stones, here we invite you to play with the building of your own land art – pillar, mound, pyramid, circle, spiral or other shape as you want. It is an excellent way to stimulate your own creativity! Through taking and stacking stones you achieve a direct tactile contact with nature, which is the main theme of this artistic-environmental project. The spiral geoglyph has been made following the cross section of the spiral shell of a fossilised foraminifera (nummulite), which, if you look a little carefully, can be found in the nearby scattered rocks on this beautiful rocky viewpoint (Donji vidikovac / Lower viewpoint) with views of the summit ridge of Učka, Stražica cliff, Vela Draga canyon and Istria. Učka and Ćićarija are built of limestone rock which had been forming by long-lasting deposition of limestone skeletons of planktonic organisms in the then Tethys Ocean in the Cretaceous period of 140 million years ago until the mid-Tertiary, 30 million years ago. A collision of the African and European plates rises Alps and the Dinarides, whose integral part are Učka and Ćićarija. Therefore, today, in this place, at a height of over 900 meters above sea level we can find the remains of organisms that once lived in the deep sea. In the place where the forest has been completely cleared there only remain sad stumps as a reminder of the impressive trees that once grew here and provided homes for numerous forest creatures. The land art installations here are a direct artistic reminder of the damage that arises due to the reckless and excessive cutting down of trees. On several stumps there are painted stones that represent the soul of the missing trees, but also the seed of new life that emerges from the desolation of human activity. This points to the power of nature to be renewed and that is impossible to destroy nature. The theme of this large rock painting (petroglyph) are lichens, their diversity and importance to the eco-system. Rock painting can be seen already from the main road, but you can get closer by the short branch trail, touch the rock art and enjoy under the Stražica cliff. The lichens are extremely sensitive to human activities such as pollution and forest clearance. Due to the loss of habitats, changes in the microclimatic conditions and pollution of the air they have become endangered. Knowledge of the lihenoflore contributes to the knowledge of biodiversity in general and is an important bioindicator of different environmental conditions. The petroglyph painted on a small stone opposite the bench draws attention to moss, which has overgrown on the mass of stones on the rock creep under the Stražica cliffs. The place is very beautiful and seems a bit like a fairytale. In the immediate vicinity there is a painted rock mosaic, partly covered with moss. Both rock paintings are inspired by the intricate forms of moss sporangia (capsules with spores) and peristomes (openings of capsules). There is a widespread misconception that moss grows on the north side of trees and rocks, and that it can determine the north. Moss grows in shady, moist areas regardless of the orientation of the habitat. This area, for example, faces the west. The theme of this point is the spiral as a basic form of nature that appears from the microcosm to the macrocosm. The spiral form is present in DNA, in the shells of foraminifera that build the limestone rocks of Učka, in snail shells, in the twists of young fern leaves and other plants, in water eddies and large atmospheric cyclones, and in the shape of galaxies. The first monolith is located along the trail and a spiral form alludes to the building elements of rocks of Učka and Ćićarija – the invisible spiral microfossils, that artistic work in this way makes it visible. The second monolith is a little indented in the woods, and the spiral deals with ferns. After reflection on the rock paintings go beyond the monolith to a little rest area, or even climb the monolith and enjoy a different perspective of the forest. This is short, blind branch of the Land art trail. It goes from the Entrance 2 to the Krog viewpoint on the Stražica cliff (1001 m), and along that branch there is only one land art installation. After visiting Krog, you must get back to the Entrance 2, and then continue the trail by following orange markings. Land art installation made of acacia logs appropriately reminiscents of the sentinel (guard) because it is located on the rise to the Krog viewpoint on Stražica. Stražica took its name from the observation points from the Uskok-Venetian War in the 17th century. The remains are visible along the elongated ridge in the form of dry stone walls and little artificially levelled clearings. Krog viewpoint at an altitude of 1001 m offers a view of the western slopes of Učka, Istria and the Josephine Road, named in honour of Emperor Joseph II, who had it built at the end of the 18th century. The road connected Kvarner and Istria over the Poklon pass until the opening of the tunnel Učka in 1981. Orange section of the Land art trail connects the Entrance 2 with the Entrance 1. Follow orange markings through the forest and they will return you to Poklon, where you started your journey. On the grassy plateau above a steep slope (on “the balcony”) there is a simple small geoglyph with multilayered symbolism of the circle and the center. Place by itself can be a pleasant resting place – inside the circle or on a small elevation on which a lovely big tree is growing. The tree invites you to hug it with gratitude to nature, and the entire site serves as a farewell to the forest before returning to the Poklon and into civilization. Messages that these works in the form of land art and rock art convey, their psychological and emotional impact, spiritual significance and importance for man’s benefit that exceeds the purely artistic and aesthetic enjoyment in the works, show that the land art is far more than art because it used to contain spiritual values, rituals and for humans important contact with nature. The oldest rock and cave drawings, paintings and petroglyphs, which regularly appear throughout history in almost every “primitive” art, as well as the geoglyphs and monolithic structures of many ancient civilizations, can easily be classified as a precursors to land art as an artistic and conceptual movement that occurred in the 1960s in the US. The whole Land art trail project can be described as an artistic, ecological and spiritual experience intended for visitors of the trail, where the artworks came to life under the influence of the mountain environment and its natural specificity, with elements of mythology and folklore that follow the concept of the artist’s work. Rock art, as the dominant part of the project, incorporates the ancient influences with new artistic practices and materials, and extends the concept of land art itself. As this is not an ordinary hiking trail but art walk, signposts on the trail are also designed in art manner. Handprint with the labyrinth is the logo of Land art trail and is located at the entrance signposts, but also on those that show the branches of trail that lead to some indented land art points. The palms with the labyrinth mark each land art point on the trail map too. The trail itself is marked with special markings in five colors, so following the map you’ll know exactly where you are on the trail. You can freely download The Guide to Stražica – Sapaćica Land Art Trail in author’s edition. The guidebook will give you an understanding of all artworks. In the guidebook there is a road map with precise information on how to get to the entrance of the Land art trail. There is also a detailed map of the Land art trail itself, with the locations of all land art and rock art works. Download it as pdf (12 pages) to your smartphone or print it out to guide you along the way. The transcendence of music and poetry, new age mysticism, unfathomable mystery of transience and death, mysterious prehistoric drawings, figures and erected stones, and above all the beauty of nature, which is, in Rijeka where Pecigoš lives, mirrored in touch of the sea and the mountains – all this is inspiration for his artistic creation. His mediums are painting and land art, while rock art (painting the rocks in nature) connects the two. He also writes poetry. Sometimes his paintings and poems are linked, that is, some idea is simultaneously manifested in art and literary media. The frequent motif of Pecigoš’s paintings are trees and their mythological and spiritual symbolism. He also explores the form of the mandala and searches the mysticism of ancient symbols (spirals, circles, sun, etc.). Sometimes, he uses a Glagolitic and Arabic alphabet. With a strong color and/or dynamic expression of lyrical abstraction, he tries to express the emotions that arise from the concept that leads him to the creation of the work. Emphasized relief and texture of the surface make possible to experience his works in a tactile way, which the artist finds very important. Land art and rock art allow Pecigoš to connect his art in the most direct manner with his love for nature and interest in geology and historical places with the remains of old cultures. In land art, he often includes his understanding of what is spiritual, and tries to evoke that mystical, ritual and sacred attitude to the forces of nature, inherent in ancient cults. The artist can communicate with the audience more directly through the land art works than through paintings, because they are interactive – they call for entering or touching them, thus achieving not only visual, but also an important tactile contact with both the work itself and the surrounding nature, which would not be possible in the gallery. Acknowledgment of HDLU Zagreb (Croatian Society of Visual Artists Zagreb) for the Land Art Trail project on Mt. Učka and the development of cultural tourism in Croatia in 2016, was given to Boris Pecigoš, the author of the trail on annual meeting of the Association on January 11, 2017.